Oscar Allen was born in a log cabin in Winn Parish to Asa Levi Allen and the former Sophronia Perkins. He attended Winn Parish schools, the Springfield Normal School and Business College in Springfield, Missouri, and Trinity University, a private institution then in Waxahachie, Texas, south of Dallas in Ellis County, Texas (Trinity is now in San Antonio, Texas.) Allen taught school in Winn Parish in 1898 and later in Mineral Springs, Texas, and Pleasant Hill in Sabine Parish. In 1908, he was an assistant registrar at Trinity. Thereafter, he worked at times in farming, railroads, the mercantile business, and in oil drilling. Allen married the former Florence Scott Love of Paris, Texas, the seat of Lamar County, Texas, on December 4, 1912. They had three children: Joyce Love (Mrs. Frederick J. Stare), Oscar Kelly Allen Jr. (born 1915), and Asa Benton Allen (born 1925). 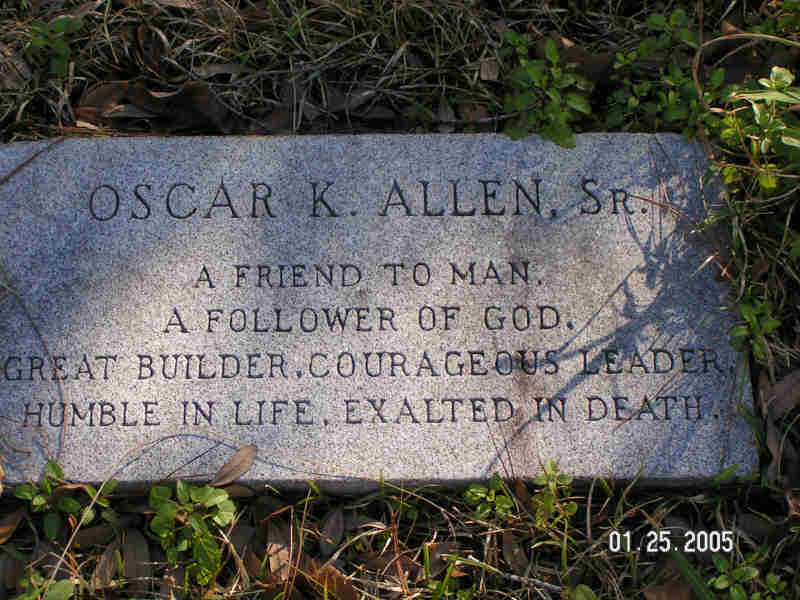 Oscar Allen took an early, active interest in politics and civic affairs. He was elected tax assessor in Winn Parish and served from 1916-1920. He was the clerk of the Winn Parish Police Jury (equivalent of county commission in other states) from 1924-1927. He was elected to the Louisiana state Senate in 1928 in the wake of Long’s landslide victory in the gubernatorial election. He defeated the anti-Long incumbent, Henry E. Hardtner of La Salle Parish, who was also a former Republican. Allen was Long’s floor leader in the Senate and was named by the governor as the chairman of the Louisiana Highway Commission from 1928 until 1930, when the Louisiana Supreme Court ruled that holding both legislative and executive positions simultaneously was unconstitutional. Oscar Allen was elected governor in the shadow of Huey Long, who had relocated to Washington, D.C., to assume his senatorial duties. Allen was considered a stooge for former governor Huey Long. Earl Long once joked that a leaf blew into Allen’s office one day and that he signed it, thinking it was legislation from Long. Elected with Allen was Huey Long’s choice for lieutenant governor, John B. Fournet of Jefferson Davis Parish. 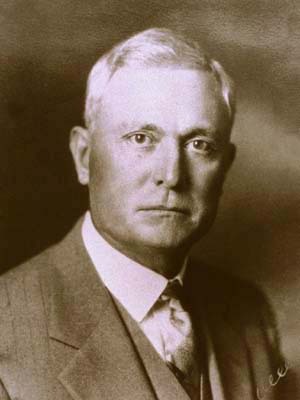 Fournet actually defeated Long’s younger brother, Earl Kemp Long, who had the support of most Long family members despite Huey’s support for Fournet. Allen signed into law Louisiana’s popular homestead exemption, legislation pushed to passage by State Senator W. Scott Heywood of Jennings, who earlier had been the first to discover oil in his adopted Jeff Davis Parish. 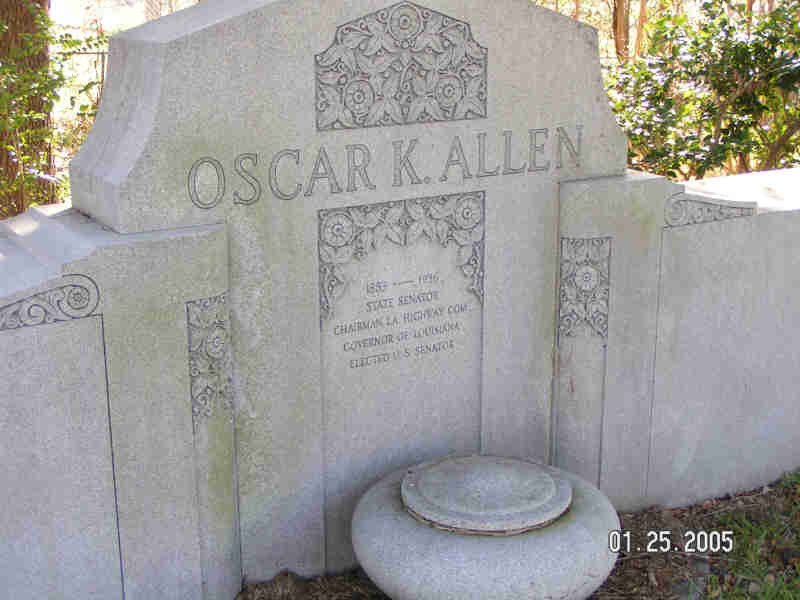 Oscar Allen died in the governor’s mansion of a brain hemorrhage. At the time of his death, he was the Democratic nominee for Long’s vacated seat in the United States Senate. He had won the Senate nomination with an unprecedented 200,000-vote plurality, but he did not live to assume the office, which went thereafter to Allen J. Ellender of Houma, the seat of Terrebonne Parish.